Above we do a couple of things. We first load the definition with kubectl. We then verify that the deployment is defined and that the pods have loaded. In this case we can see that the pod has been deployed on the host ubuntu-5 and the pod has an IP address of 10.100.3.7. At this point – the only way to access the pod is directly by it’s pod IP address. If you noted in the above deployment definition we said that the containers port was 8080. By doing a curl to the pod IP on port 8080 we can see that we can reach the service. The main thing a service defines is a selector. That is – what the service should be used for. In this case, that selector is ‘app: web-front-end’. If you’ll recall – our deployment listed this label as part of it’s specification. Next – we need to define the ports and protocols the service should use. In this case we’re using TCP and the port definition specifies the port the service will listen on, in this case 80. At this point I think it’s easier to think of the service as a load balancer. The ‘port’ definition defines the port that the front end virtual IP address will listen on. The ‘targetPort’ specific what the back-end hosts are listening on or what the traffic should be load balanced to. In this case, the back-end is any pod that matches our selector. Interestingly enough – instead of specify a numeric port here you can specify a port name. Recall from our deployment specification that we gave the port a name as part of port definition, in this case ‘web-port’. Let’s use that with our service definition rather than the numerical definition of 8080. In the above output we used the kubectl ‘run’ sub-command to start a pod with a single container using the image ‘jonlangemak/net_tools’. This image is quite large since it is using Ubuntu as it’s base image but its serves as a nice testing endpoint. Once the pod is running we can use the kubectl ‘exec’ sub-command to run commands directly from within the container much like you would locally by using ‘docker exec’. In this case, we curl to the IP address assigned to the server and get the response we’re looking for. Great! As we’ve seen already the net-test pod can access the deploy-test-1 pod both via it’s pod IP address as well as through the service. Let’s start by doing a packet capture as close to the source container (net-test) as possible. In that case, that would be on the VETH interface that connects the container to the cbr0 bridge on the host ubuntu-4. To do that we need to find the VETH interface name that’s associated with the pause container which the net-test container is connected to. Note: If you arent sure what a pause container is take a look at my last post. 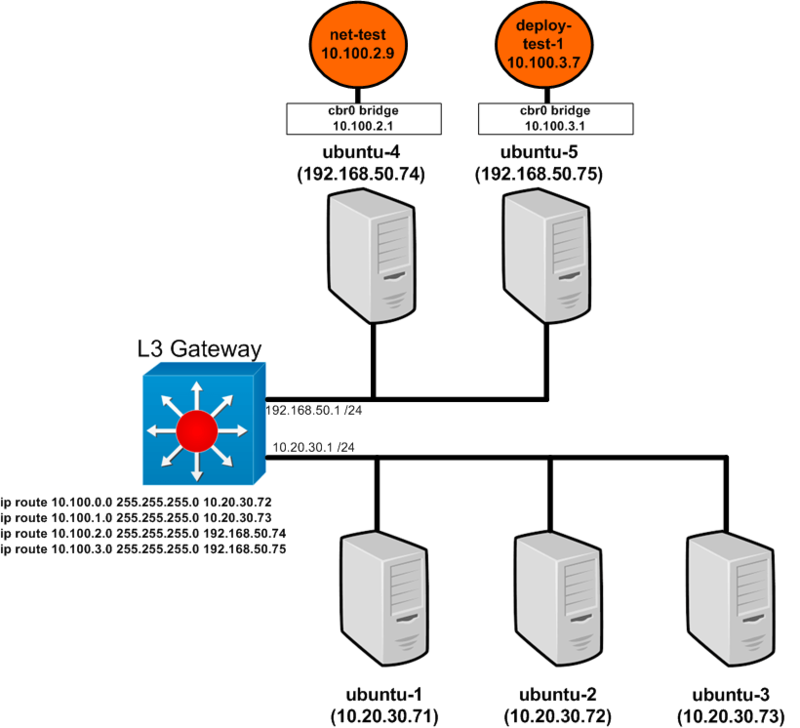 As it turns out – services are actually implemented with iptables rules. 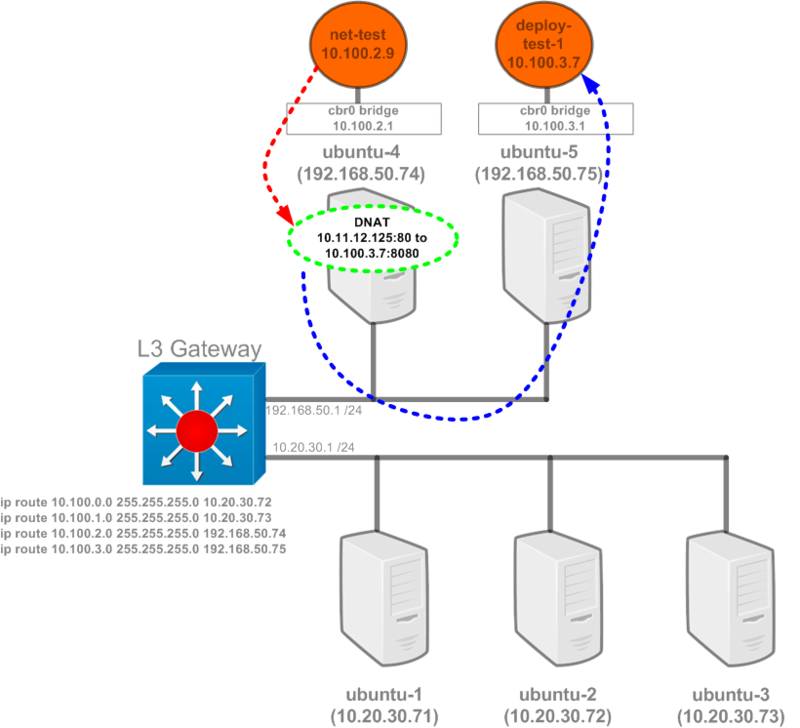 The Kubernetes host is performing a simple destination NAT after which normal IP routing takes over and does it’s job. Let’s now dig into the iptables configuration to see exactly how this is implemented. Side note: I’ve been trying to refer to ‘netfilter rules’ as ‘iptables rules’ since the netfilter term sometimes throws people off. Netfilter is the actual kernel framework used to implement packet filtering. IPtables is just a popular tool used to interact with netfilter. 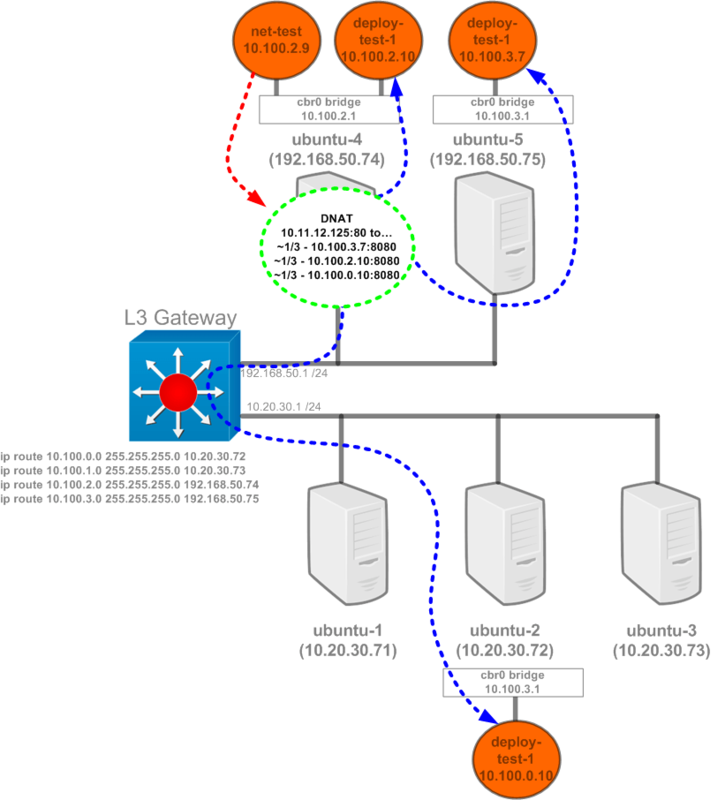 Despite this – netfilter is often referred to as iptables and vice versa. So if I use both terms, just know Im talking about the same thing. Side note: I prefer to look at the iptables configuration rather than the iptables command output when tracing the chains. You could also use a command like ‘sudo iptables -nvL -t nat’ to look at the NAT entries we’ll be looking at above. This is useful when looking for things like hits on certain policies but be advised that this wont help you with the current implementation of kube-proxy. 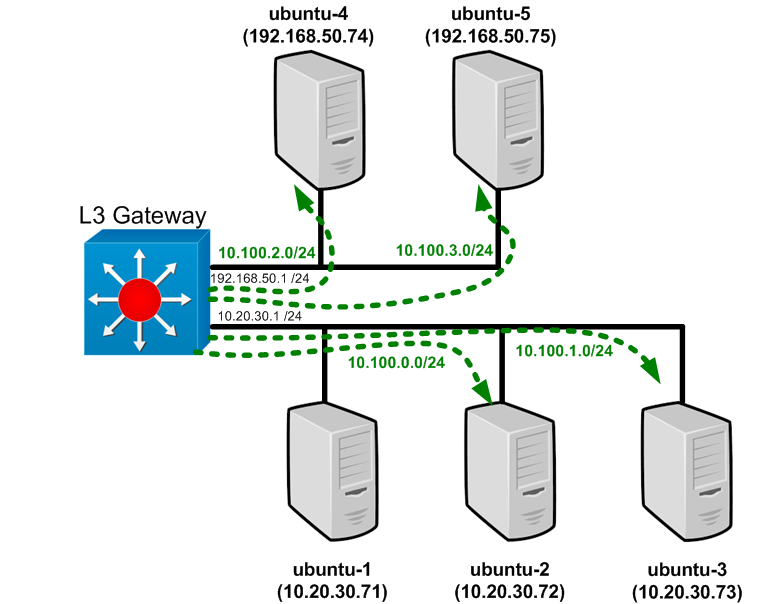 The iptables policy is constantly refreshed clearing any counters for given rules. That issue is discussed here as part of another problem. Previous versions of the kube-proxy service actually handled the traffic directly rather than relying on netfilter rules for processing. This is still an option ,and configureable as part of the kube-proxy service defintion, but it’s considerably slower than using netfilter. The difference being that the kube-proxy service runs in user space whereas the netfilter rules are being processed in the Linux kernel. Note: I know that’s tiny so if you can’t make it out click on the image to open it in a new window. Since the container is generating what the host will consider forward traffic (does not originate or terminate on one of the devices IP interfaces) we only need to concern ourselves with the PREROUTING and POSTROUTING chains of the NAT table. It’s important to also note here that the same iptables configuration will be made on each host. This is because any host could possibly have a pod that wants to talk to a service. The first match occurs at the bottom of the PREROUTING chain. There is no match criteria specified so all traffic that reaches this point will match this rule. The rule specifies a jump target pointing at the KUBE-SERVICES chain. When we get to the KUBE-SERVICES chain we don’t match until the second to last rule which is looking for traffic that is destined to 10.11.12.125 (the IP of our service), is TCP, and has a destination port of 80. The target for this rule is another jump pointing at the KUBE-SVC-SWP62QIEGFZNLQE7 chain. When we get to the KUBE-SEP-OA6FICRP4YS6R3CE chain we don’t match on the first rule so we roll down to the second. The second rule is looking for traffic that is TCP and specifies a target of DNAT. The DNAT specifies to change the destination of the traffic to 10.100.3.7 on port 8080. DNAT is considered a terminating target so processing of the PREROUTING chain ends with this match. When a DNAT is performed netfilter takes care of making sure that any return traffic is also NAT’d back to the original IP. This is why the container only see it’s communication occurring with the service IP address. The above depicts the ruleset in place for the PREROUTING chain on one of the minions. I’ve removed all of the rules that didn’t result in a target being hit to make it easier to see whats happening. This looks a lot like the output we saw above with the exception of the KUBE-SVC-SWP62QIEGFZNLQE7 chain. 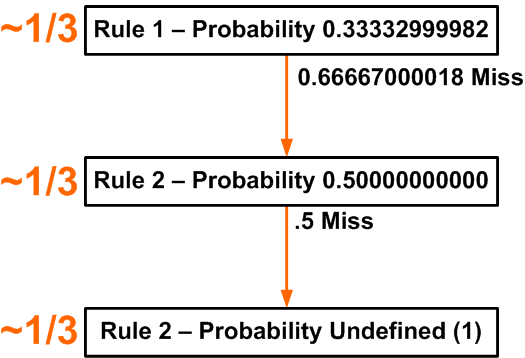 Notice that some of the rules are using the statistic module and appear to be using it to calculate probability. This is allows the service construct to act as a sort of load balancer. The idea is that each of the rules in the KUBE-SVC-SWP62QIEGFZNLQE7 chain will get hit 1/3 of the time. This means that traffic to the service IP will be distributed relatively equally across all of the pods that match the service selector label. It’s important to call out here that this is providing relatively simple load balancing. While it works well – it relies on the pods providing fungible services. That is – each back-end pod should provide the same service and not be dependent on any sort of state with the client. Since the netfilter rules are processed per flow, there’s no guarantee that we’ll end up on the same back-end pod the next time we talk to the service. In fact there’s a good chance we wont. From that point, the processing is largely similar to what we saw from the pod perspective. One thing to point out though is that since the hosts are not configured to use Kube-DNS they can not, by default, resolve the services by name. In the next post we’ll talk about how you can use services to provide external access into your Kubernetes cluster. Stay tuned! I’ve gone through a number of your blogs. Hats off to your level of detail and the progress you have identified. Really helped me tremendously to validate the theory of operation.